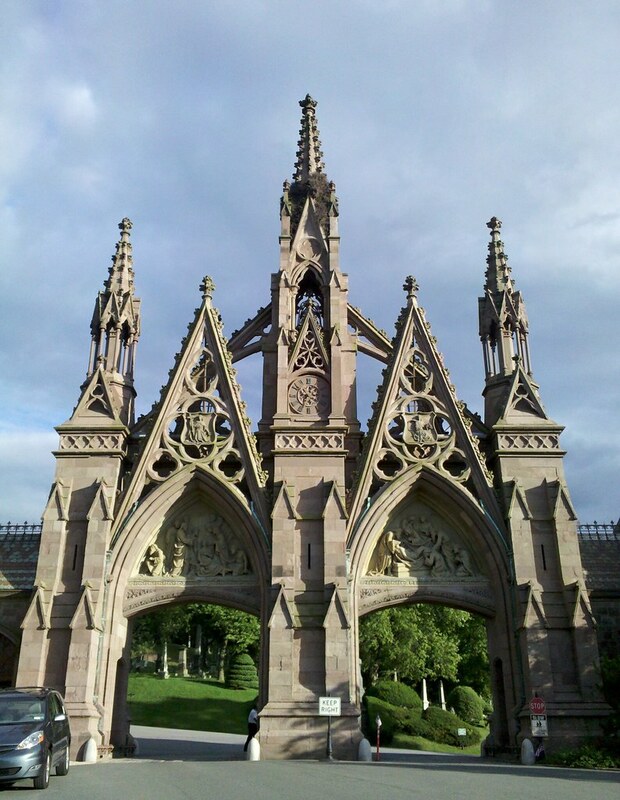 Welcome to Green-Wood Cemetery, one of the first, and grandest, examples of an American rural cemetery. Founded in 1838 on 478 magnificently wooded acres of glacial hills and dales, it once rivaled Niagara Falls as the country's premier tourist attraction. There's too much to see in just one day, so I'll be back for at least a few more visits over the next two years. You may be able to discern a brown blob emerging from the base of the spire atop the gateway's central tower. It's a gigantic nest built by the famed Brooklyn parrots; Green-Wood is one of their strongholds. Oh WOW! When I first opened your site, I could only see the top part of the picture and thought I was looking at a picture of a European Castle…but instead I find it’s a gorgeous entrance to a cemetery. Wow. Just beautiful! What a beautiful portal, and the nest is an added attraction.